I’ve been to Bali once before. 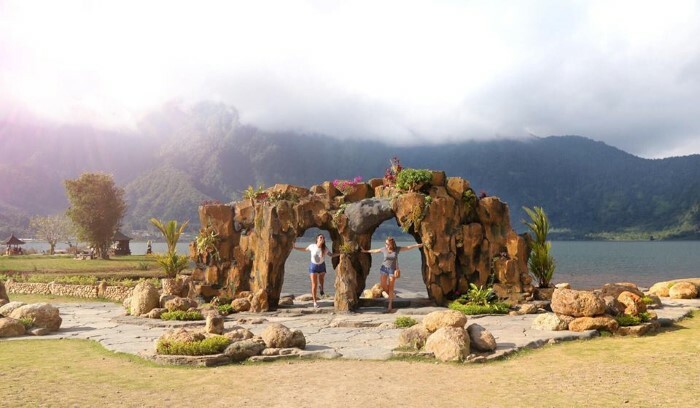 At the end of our epic fortnight around Indonesia with the tourist board. 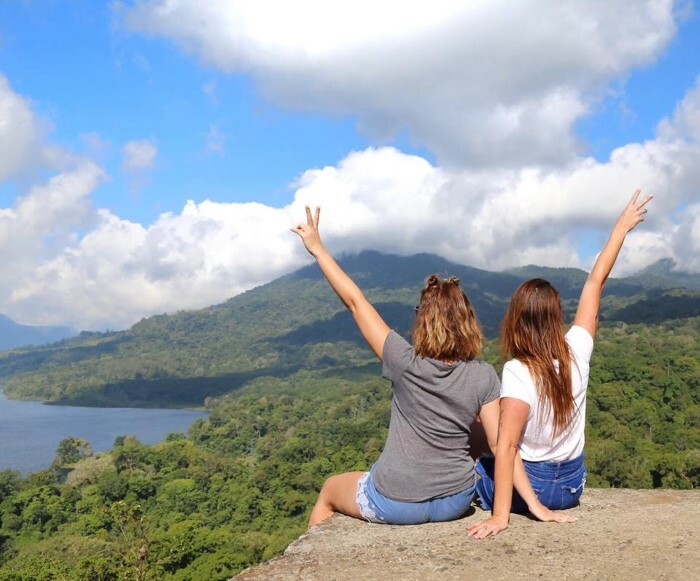 We visited Borneo, Wakatobi and Komodo before finishing our journey in Bali! 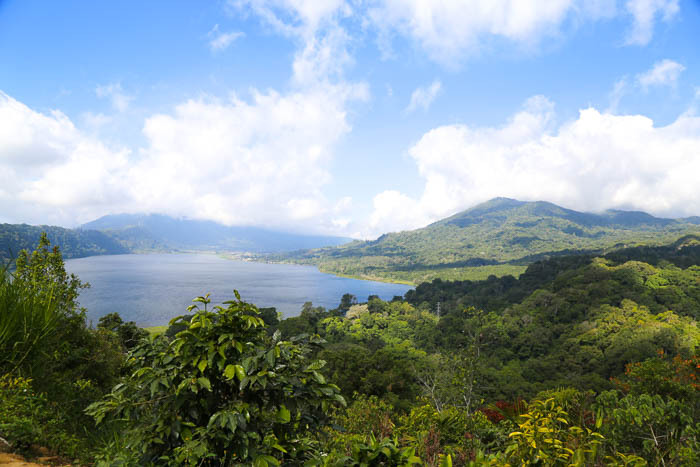 But by the time we reached Bali we were pretty exhausted and not up to exploring much, so I left feeling I hadn’t really seen the full potential of this beautiful part of the world. Which is why when Thai Airways offered to take me back there this year I jumped at the chance to explore more and get a real feel for Bali life! 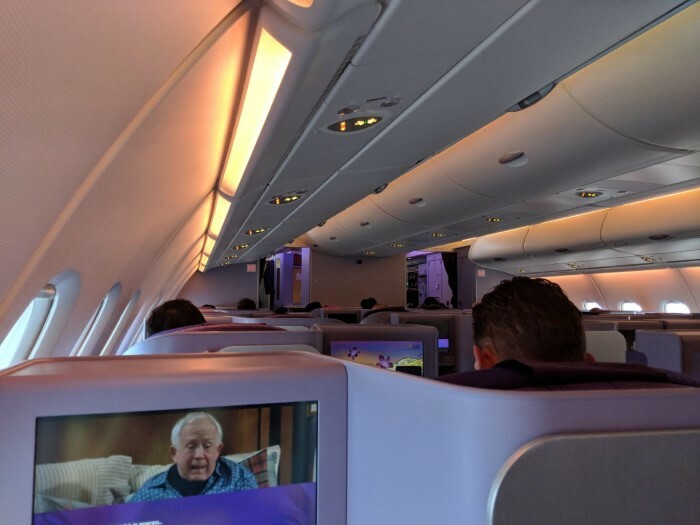 Thai Airways fly to Bali from London Heathrow and it takes about 16-17 hours flight time to get there usually split into two flights with a stop in Bangkok. 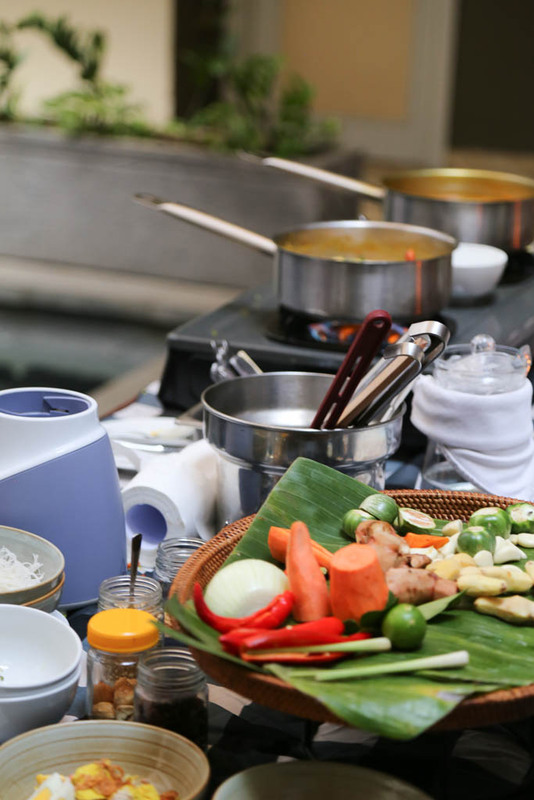 If you feel the journey is a bit much for you all in one go, why not stop over in Bangkok for a night or two?! 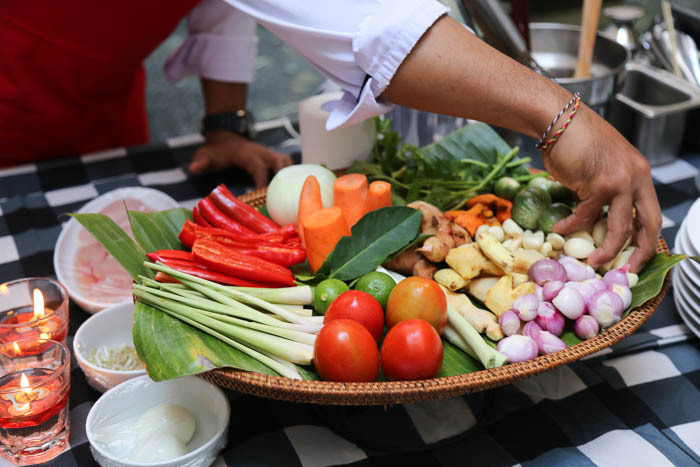 I absolutely loved Bangkok when I visited last year, so it’s worth having a bit of an explore either on your way to Bali or on the way back – two holidays in one! 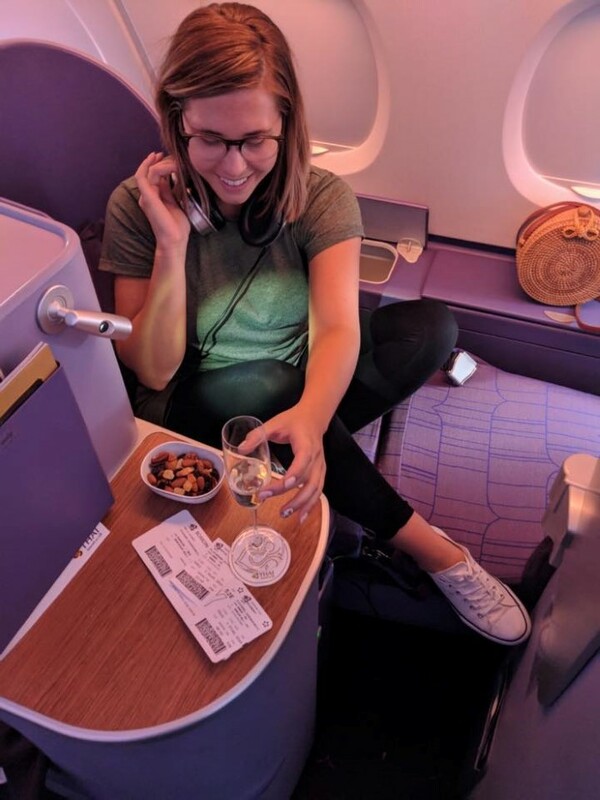 This time we went straight through and we also had the privilege of travelling in both Economy and Business – Royal Silk Class – with Thai Airways, so I can give the skinny on both…spoiler alert, they both whizzed by! Our stint in Economy was more than comfortable. 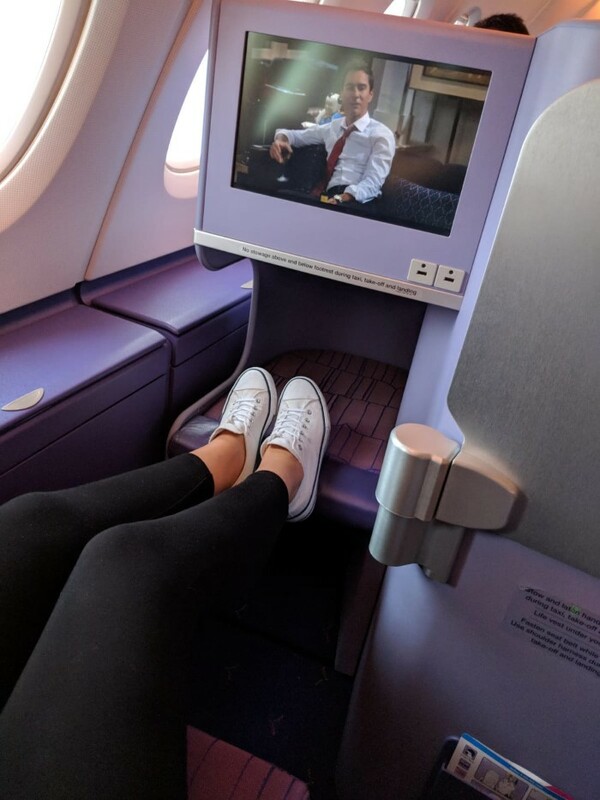 Our plane was lovely with generous leg room, foot rests which help with stretching out, lots of cabin space and personal tvs that were pretty big and filled with new movies to keep you busy during the flight. The thing that stood out for me in Economy with Thai Airways was the food, it was actually pretty good! 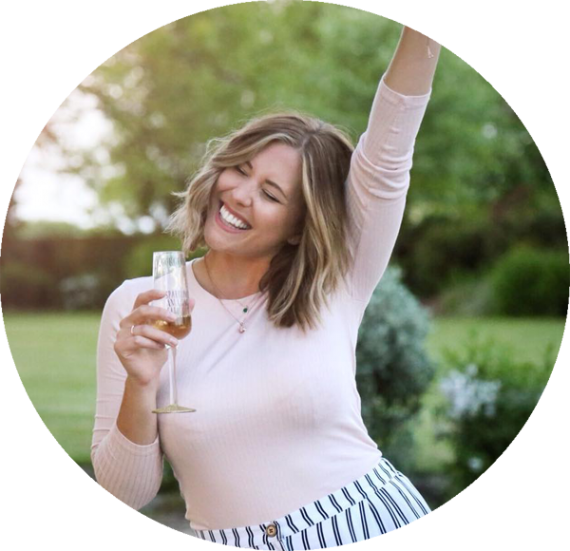 I thoroughly enjoyed all my meals on board which were flavoursome and filling with snacks in between and a mean G&T made by the kind and attentive crew! 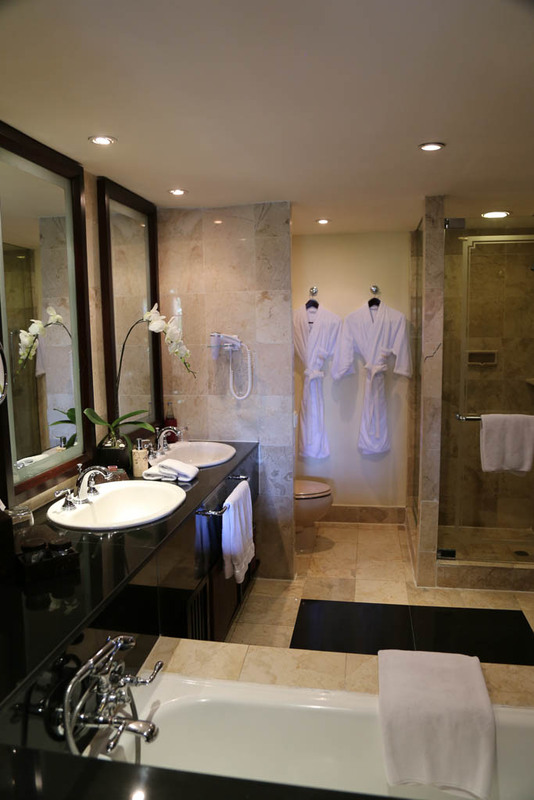 The toilets were immaculate as was the rest of the cabin which made for a very pleasant flight indeed – one happy customer right here arriving to our destination cheery and excited to explore! 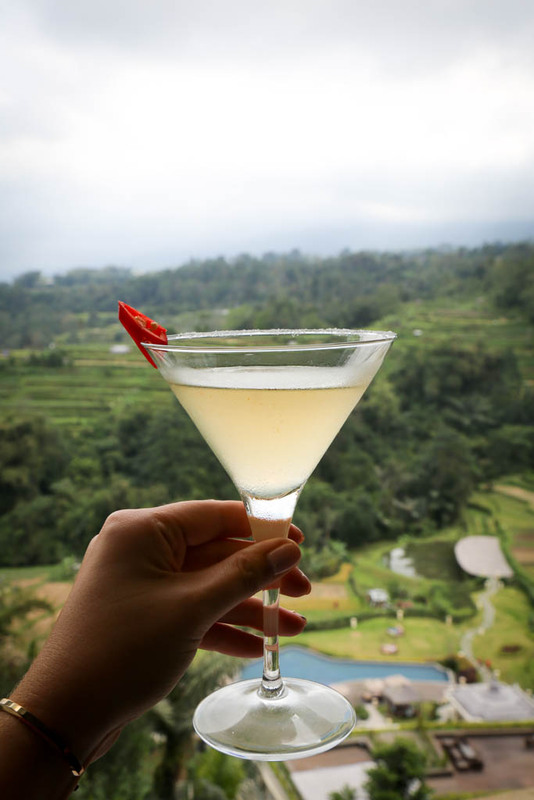 For those of you thinking of travelling to Bali for a special occasion like a honeymoon, or those of you that just like a bit of comfort, then Royal Silk Class is for you! With fully flat beds (that even have a massage function! 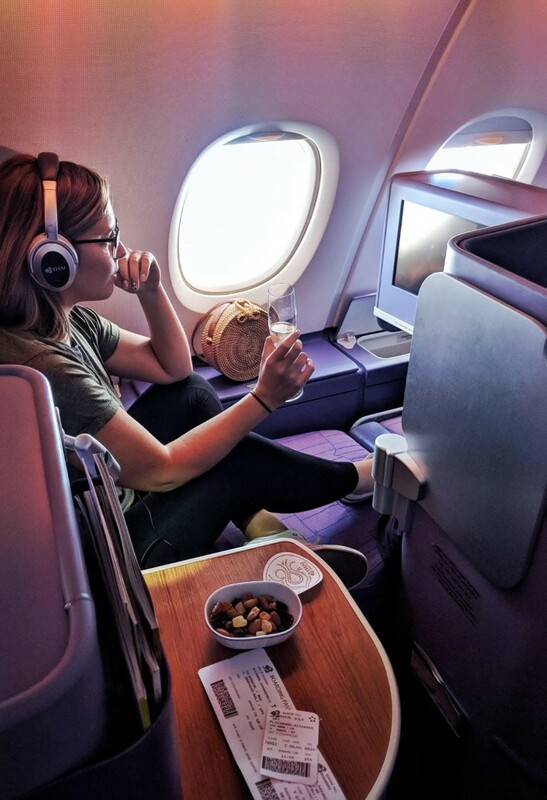 ), fantastic a la carte food, a good wine and drink selection, high quality headphones and a lovely spacious cabin – Royal Silk Class with Thai Airways makes long haul travel a breeze. Highly recommended from me and my bad back, especially as I managed a fantastic night’s sleep on that lie flat bed…no grumpy jet lagged Amelia on the other side, yay! 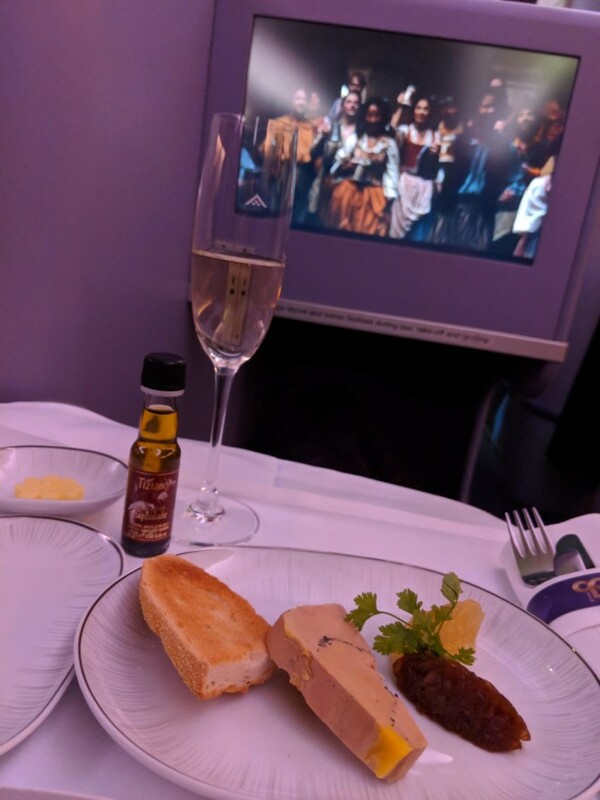 Travelling Royal Silk Class with Thai Airways is a wonderful experience and certainly on to look into when you book to really take your holiday to the next level – have a glass of Veuve Cliquot for me! 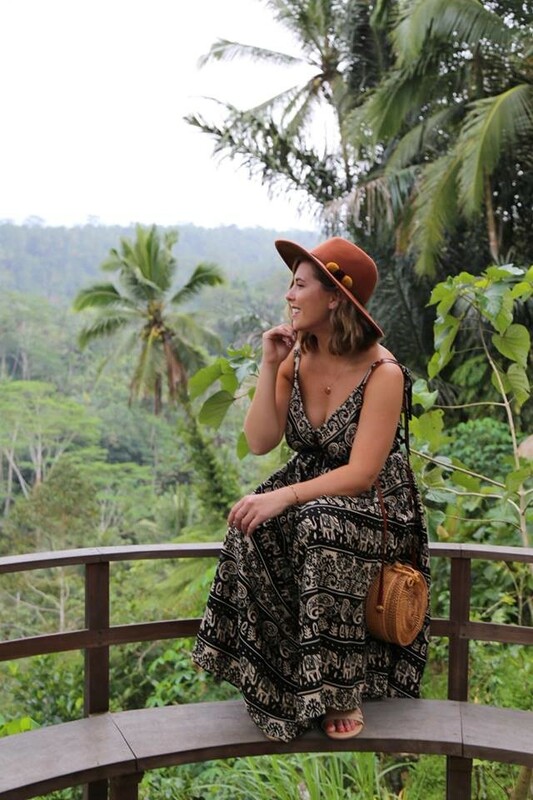 After our incredibly pleasant flights we arrived in Bali ready to explore! We travelled from the south to the north and back again stopping at so many beautiful places on the way. 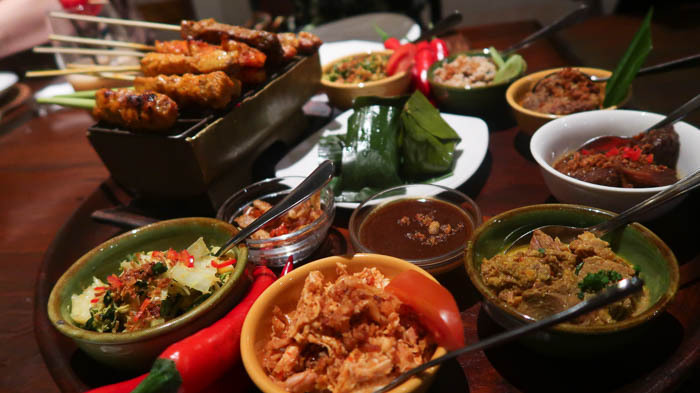 Ok, so you know me, I can’t go anywhere without talking about food, and Balinese cuisine really is something special. 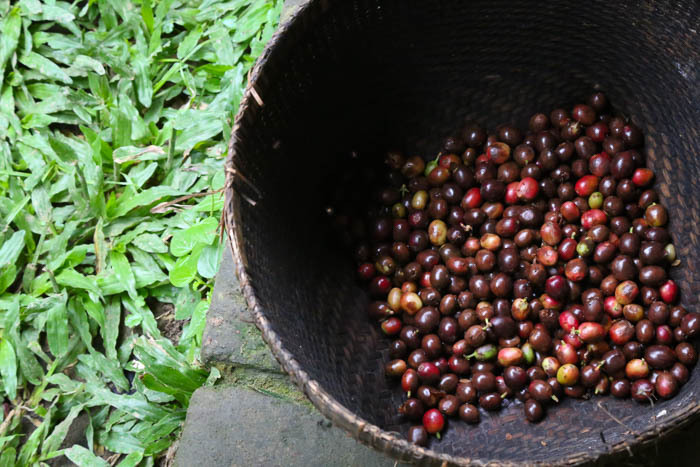 The spice, the flavours, the variety – it’s got everything and I just couldn’t get enough. 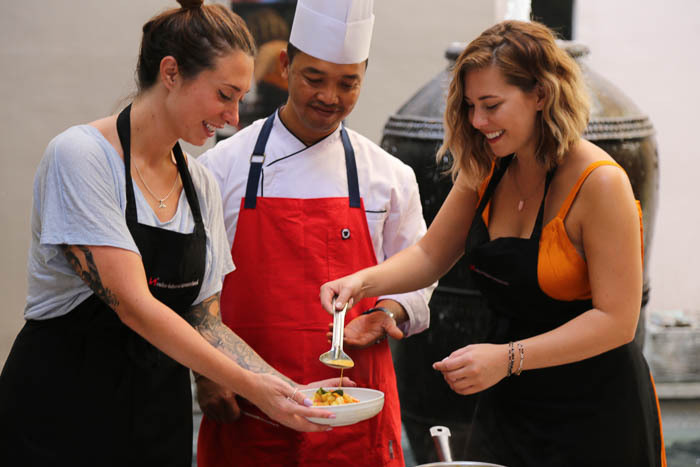 If you’re heading to Bali the I’d 100% recommend booking in for a cooking class to really get a feel for some true Indonesian dishes. 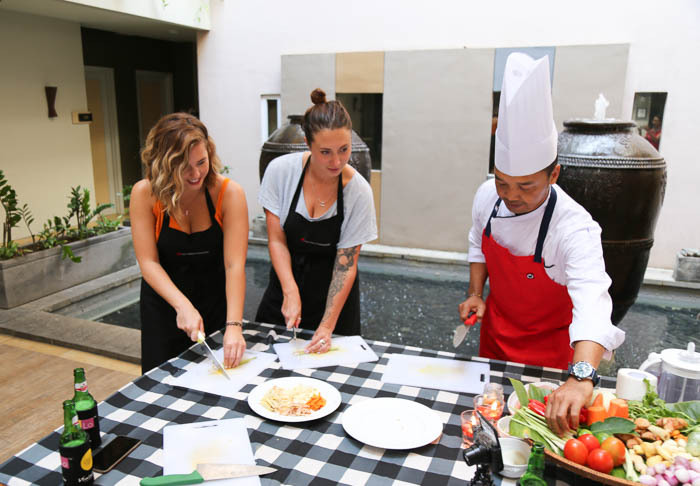 During our stay in Bali we did a class at the Swiss Bel hotel in Legian where we travelled to the local market in the morning to buy our ingredients and then created an entire 3 course lunch from scratch! Walking around the markets was lovely. Seeing all their fresh ingredients (some brand new to me!) 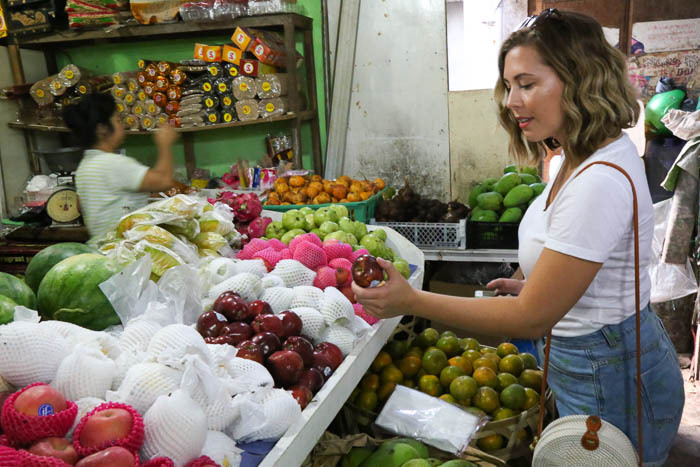 and how easy it is out there to get hold of fresh spices, vegetables, fruit and meats fresh and ready to be thrown into an awesome dish! Our guide made sure we didn’t forget anything and paid for it all so we were ready to head back to the kitchen and get cracking. 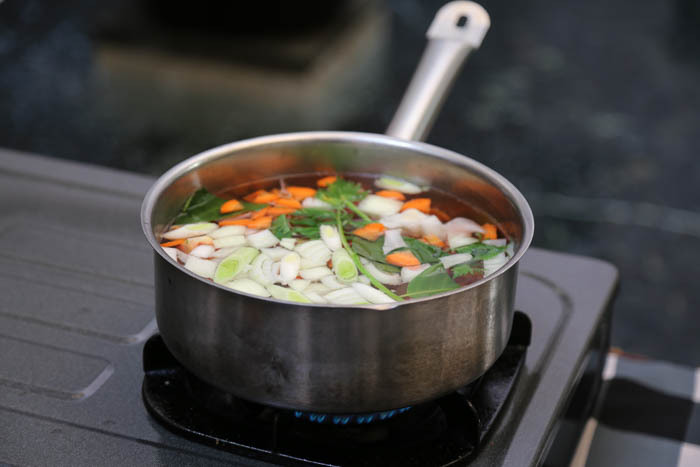 We started by making a spicy chicken soup which was actually really easy to do with garlic, onions, chili and ginger in a broth..and a bit more chili for good measure! 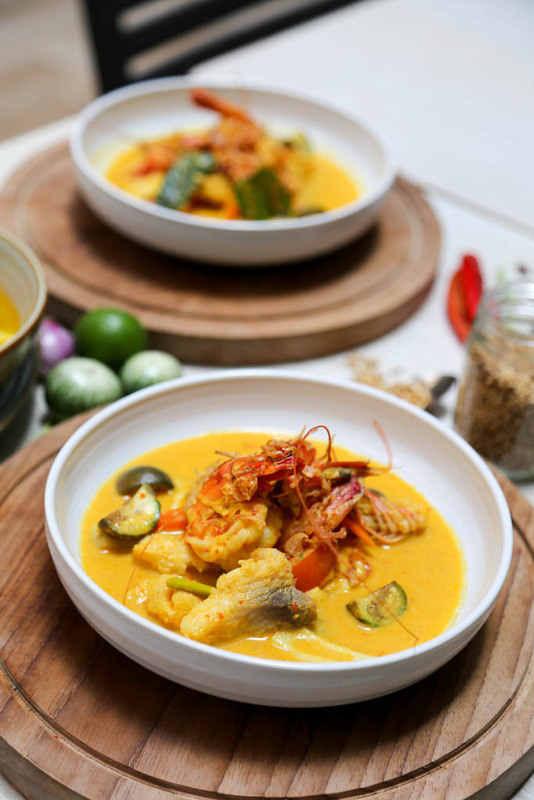 Main course was a seafood yellow curry with home made curry paste, finished off with coconut pancakes and palm sugar coated pineapple. I could eat it all over again! 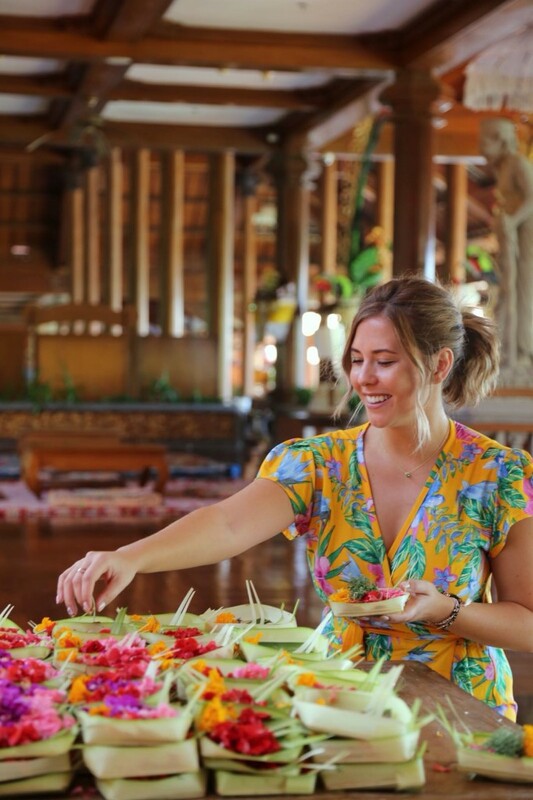 It was such a fun morning learning about all the ingredients used in Balinese cooking including some ingredients that I had never even heard of before. Our chef was super helpful (and patient) and made sure we ate very very well at the end of it. 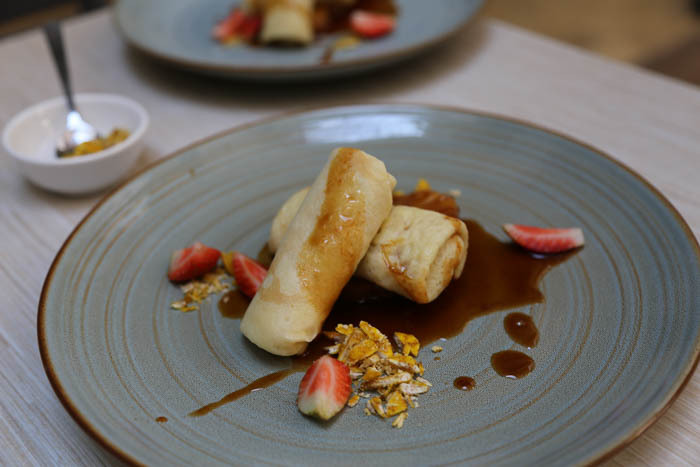 Such a fab thing to do when you visit and well worth booking in for! 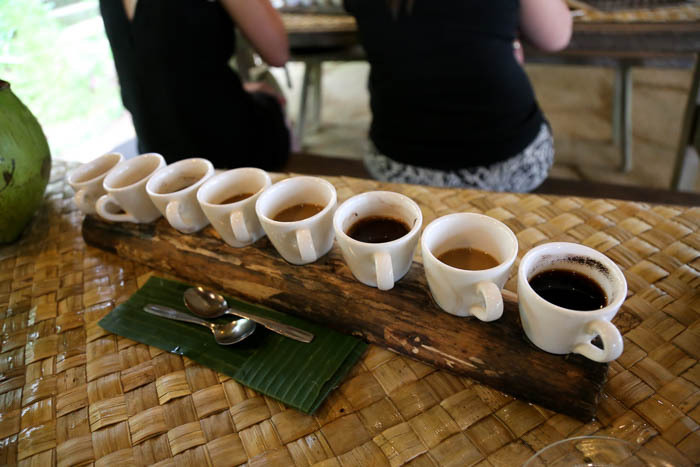 Balinese coffee is also pretty darn awesome and well worth a try when you’re out there. 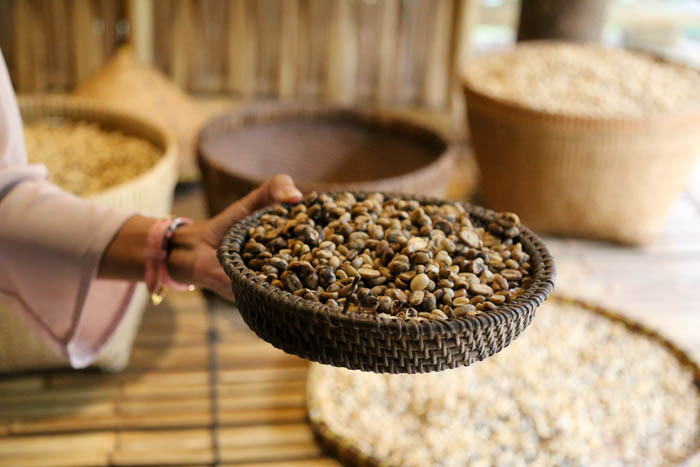 During our visit we went to Bali Pulina and tried so many different varieties of tea and coffee all while learning how they harvest, sort and roast the beans. My favourite was their Ginseng Coffee, a wonderfully spicy, sweet and milk drink that should definitely be a thing back in the uk! 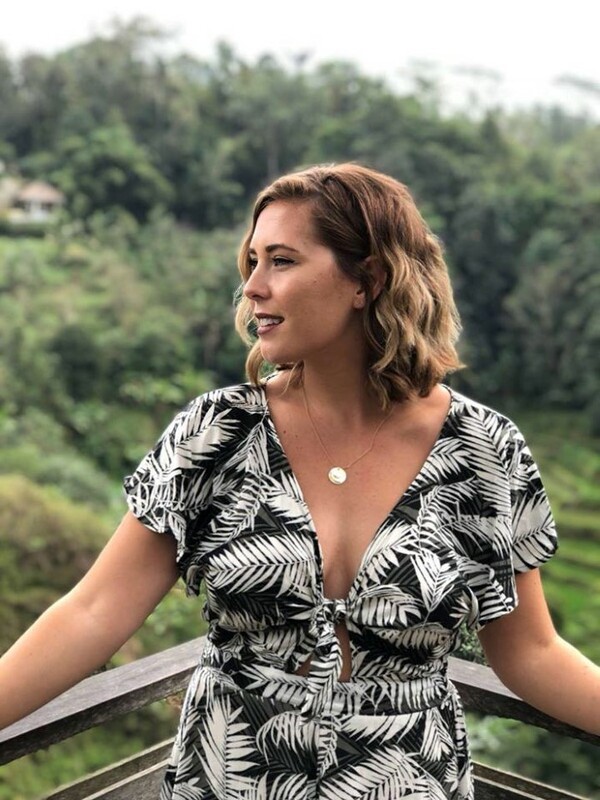 While you’re in Bali you can also find a lot of rice plantations which allow you to talk a look around and even plant your own rice – it’s fascinating and also super fun! 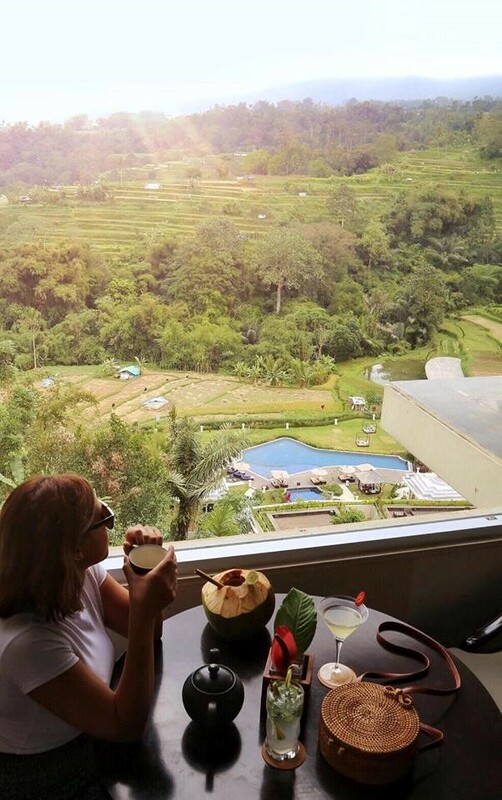 The rice paddies really do give Bali it’s traditional ‘look’ with it’s stunning greenery and the shelves of the fields in the distance. 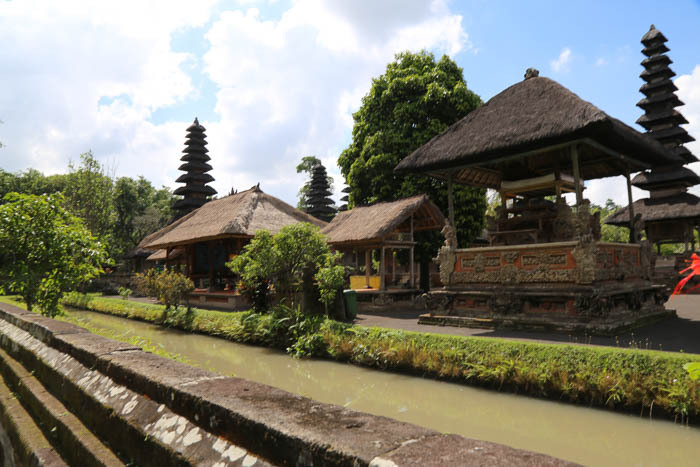 I for one had no idea before I came to Bali that you planted rice in muddy water so this was really interesting for me and worth a day trip whilst taking in the stunning scenery. 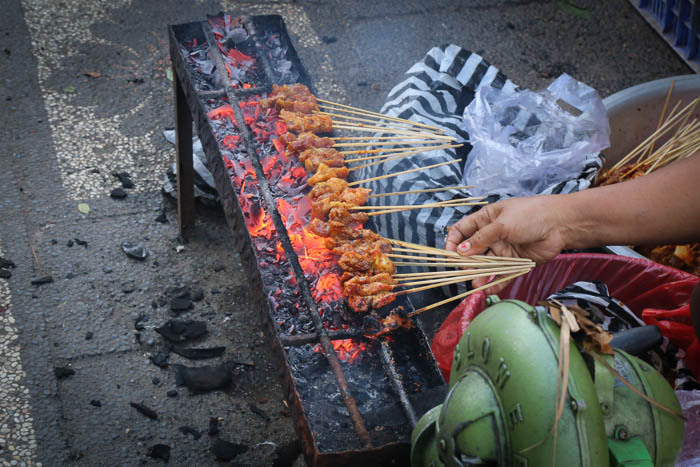 And finally, you can’t come to Bali and not try out some of their street food! 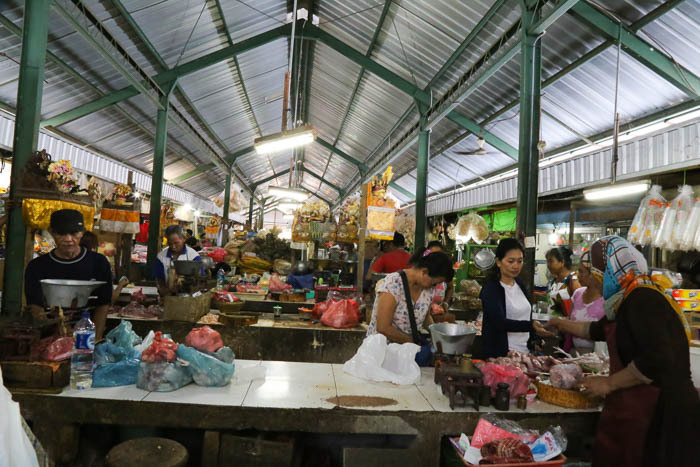 Satay is huge over here and you’ll see sellers in markets roasting loads of it over a little BBQ pit with a deliciously sweet peanuty sauce – it’s amazing, buy 5! 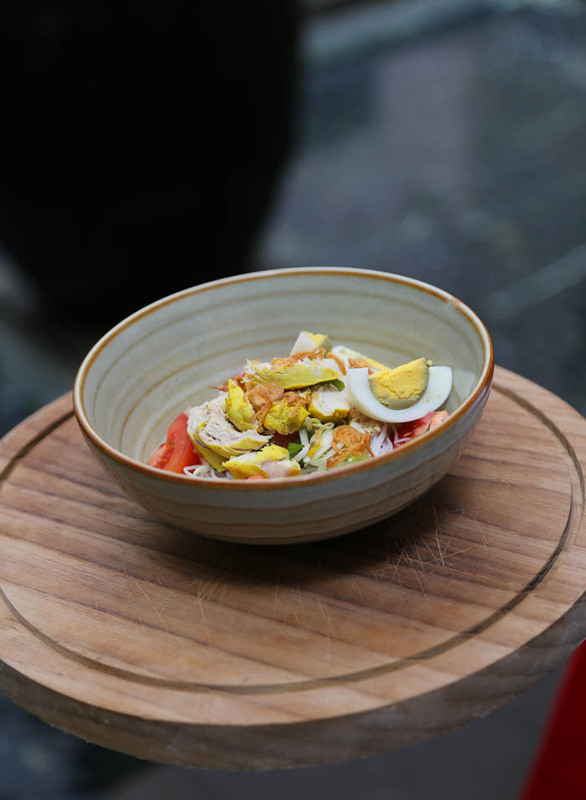 There’s also a lot of street food sellers who make Mee Goreng or Nasi Goreng which is either a rice(nasi) or noodle(mee) dish with chicken, onions and a fried egg – it’s DELICIOUS and you must try one or the other – or both – while you’re out there! For desert the Balinese eat Es Campur which is like a condensed milk soup with fruit, topped with a shaved ice mountain and covered in syrup! It’s an odd one but strangely refreshing and it comes in a multitude of colours! 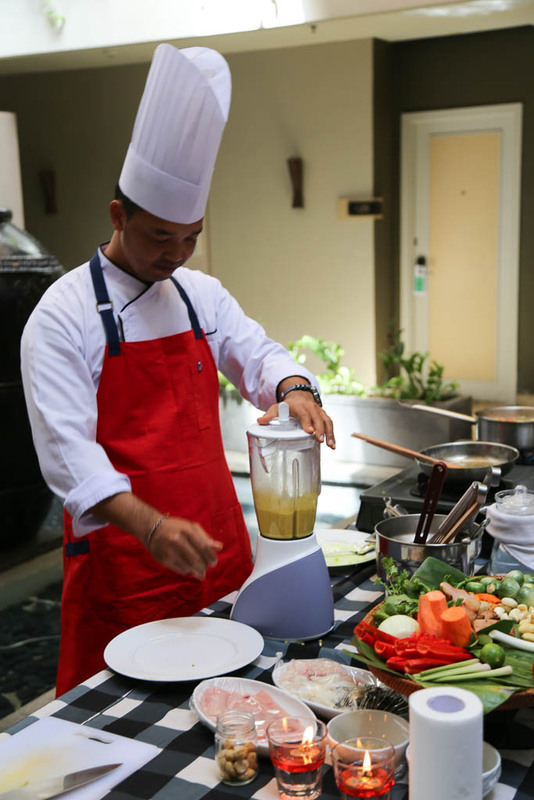 The best thing to do with Balinese food is just give it a go and try as much as you can. 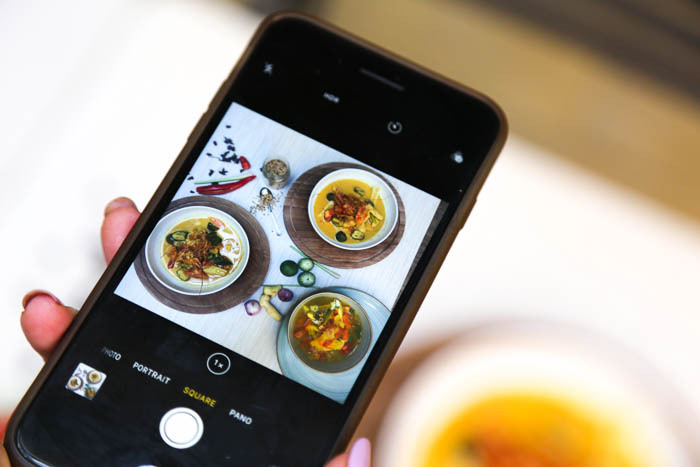 The flavours are amazing..just watch out for Sambal, which is like a chili oniony dip/sauce – a proper one of these will blow your head off! One thing that really stands out for me about Bali is their sense of community. Their dedication to religion and keeping their part of the world beautiful. Each family has a temple in which they pray, and there are also larger community temples too which you’ll find dotted around villages, out on the road and even in houses. They’re stunning. 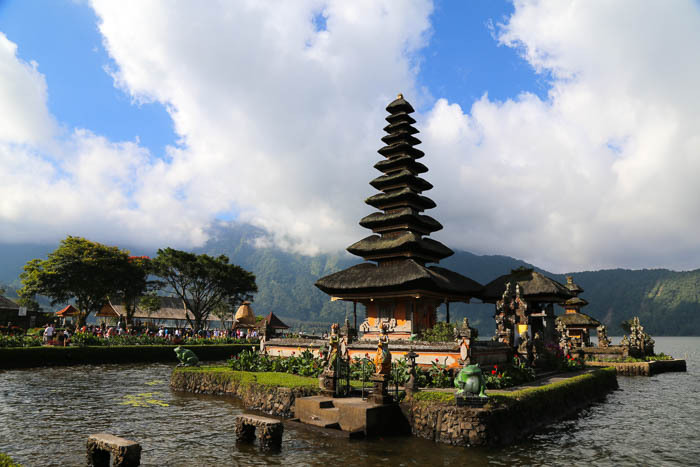 Taking time to visit some of the temples in Bali is a must, they’re incredibly unique and beautiful to behold, like the temple on the water on the shores of Lake Batan which sits serenely surrounded by misty mountains and water. 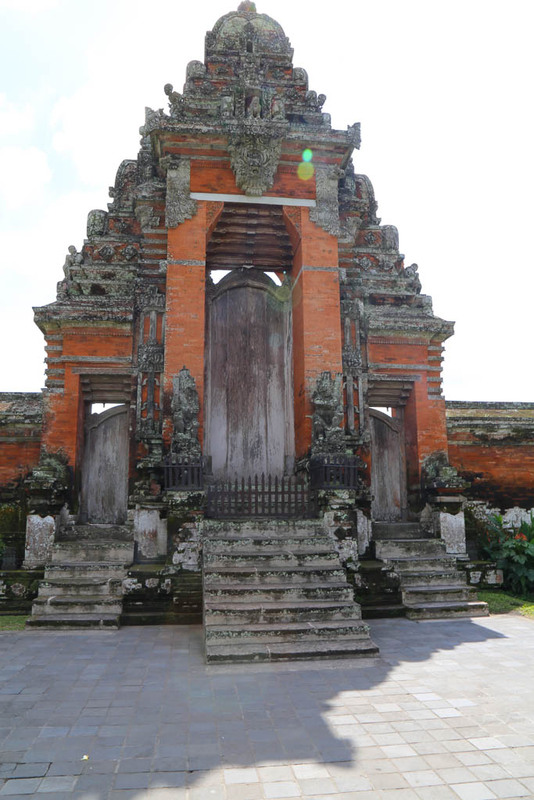 Or Taman Ayun, a beautiful royal temple built in the 1600’s and still open for visitors today – one of the most beautiful I’ve seen in Bali. And finally Uluwatu temple is a fantastic temple to visit if you have the time – here you have stunning sheer cliff faces and the opportunity to watch the traditional Balinese Fire Dance which I did the last time I was in Bali. It’s fascinating and quite beautiful as the sun sets over the cliffs. Everywhere you walk in Bali you’ll find little woven baskets of flowers on the floor or on walls. These are called Canang and are offerings to the gods that the Balinese place out fresh every single day. They’re beautiful and are often burning with incense which fills the streets as you walk by. 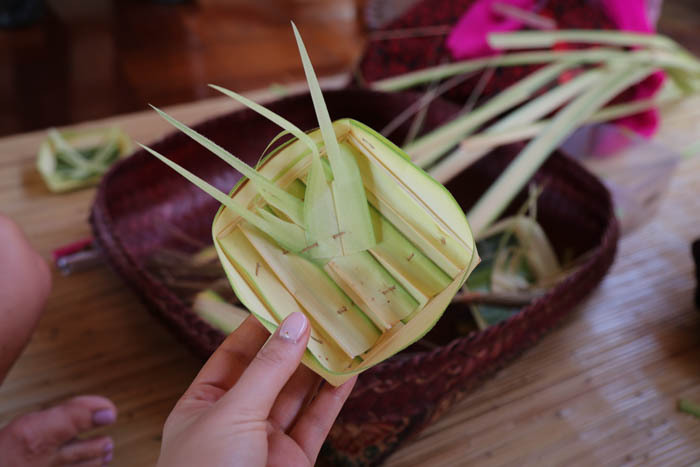 We even had a go at making them during our stay at Ayodya Bali – all the different coloured flowers are placed in certain places to represent the different gods and thousands of these are made every single day in Bali, it’s incredible. 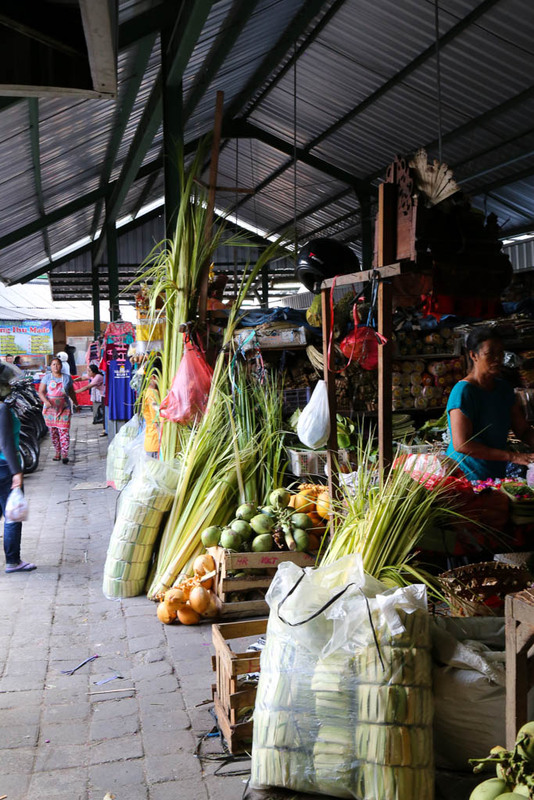 I find the Indonesian people to be incredibly helpful and friendly, especially the Balinese so you’re sure to feel completely welcome as soon as you step off the plane. There really isn’t another place like it that I’ve travelled to so far, I simply adore their way of life, their faith and their community spirit. 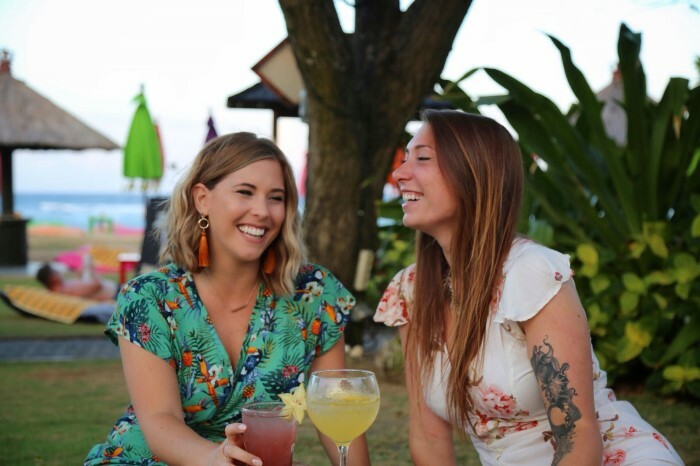 And of course we couldn’t go to Bali and not talk about the beaches – it’s the ideal place for a relaxing holiday or your special honeymoon – the views, the clear waters, the white sands and the coconuts…bliss! 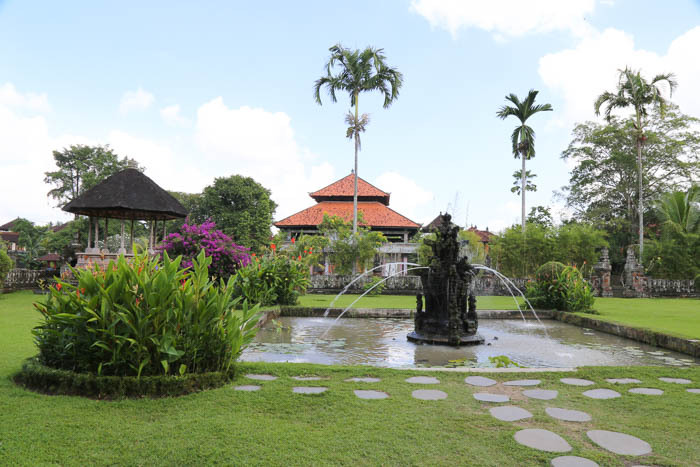 During our trip we ventured up to North Bali to a resort called the Amertha Villas in Pemuteran. About 3 hours drive from Kuta it’s like a whole other world and was the most peaceful part of our stay. 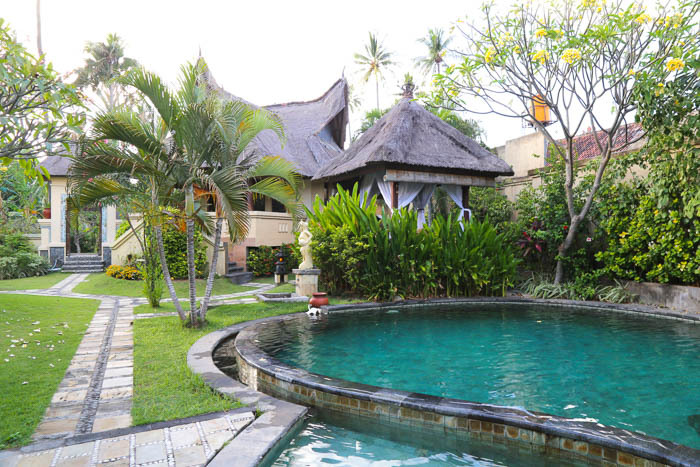 We stayed in a villa which had a shared lagoon pool with three others and it was like being in your own little paradise. 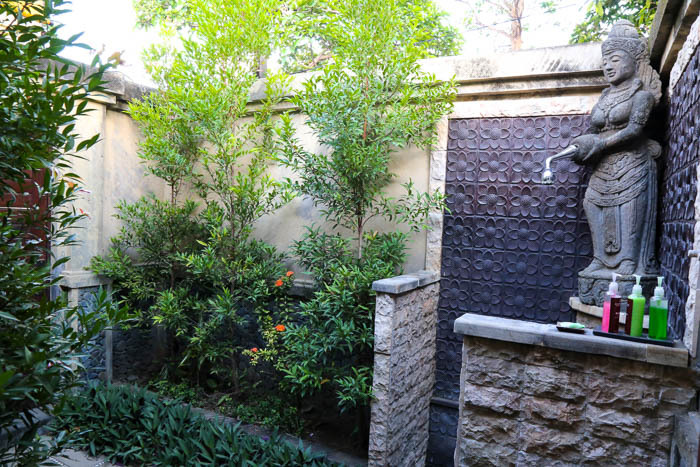 With outdoor showers, 4 poster beds and our own little courtyard surrounded by palms and beautiful flowers it was like a whole other country compared to the bustling streets of Kuta. 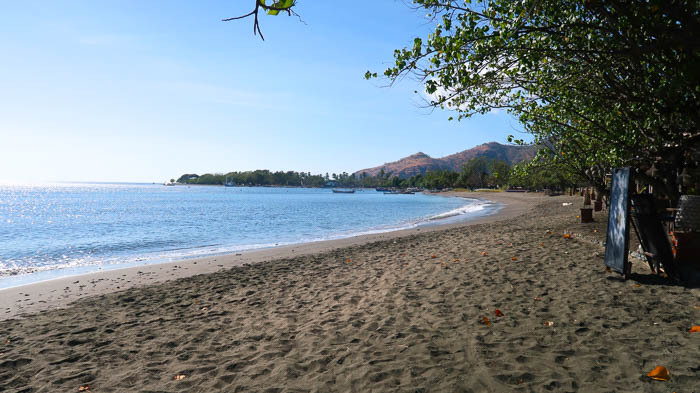 Pure white beaches and clear waters one way, and quiet streets with Balinese spas and trinkets on the other, it’s the perfect place to travel if you want to get away from it all. And with the three hour transfer only costing you around £35 each way it’s more than doable. 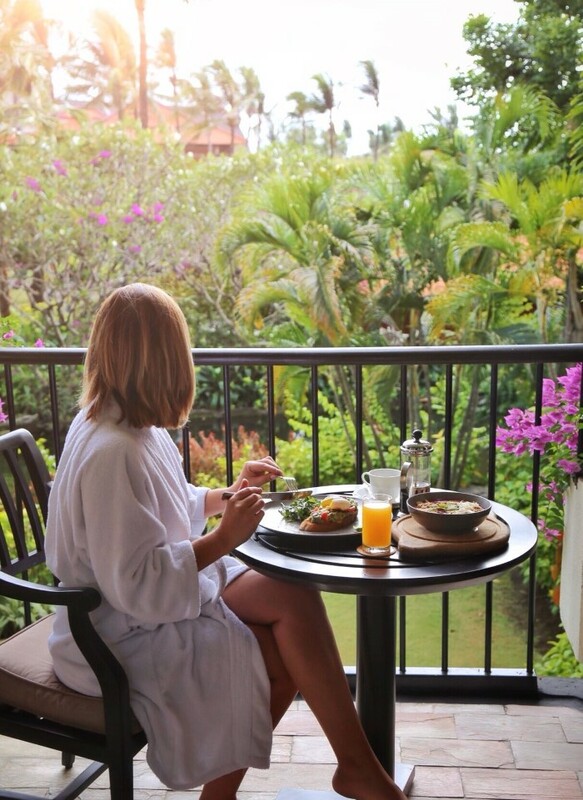 It’s the ideal honeymoon spot – imagine breakfast in your private pool every morning, wow. 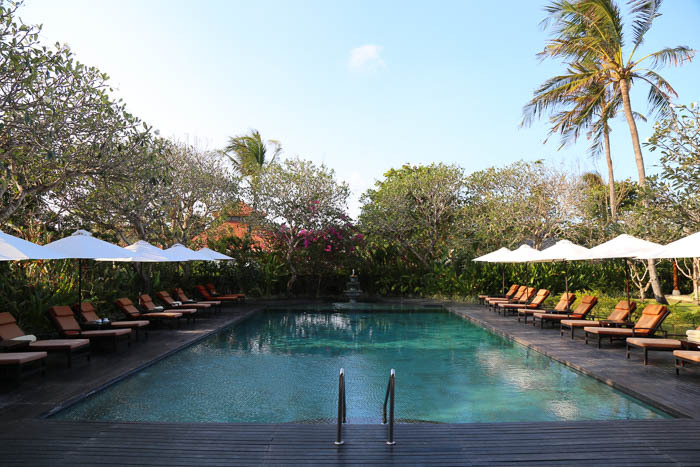 Or why not try a week in Nusa Dua, a gorgeous part of Bali with a bit more of a buzz but a relaxing vibe throughout – Nusa Dua is has a luxury all inclusive holiday vibe! 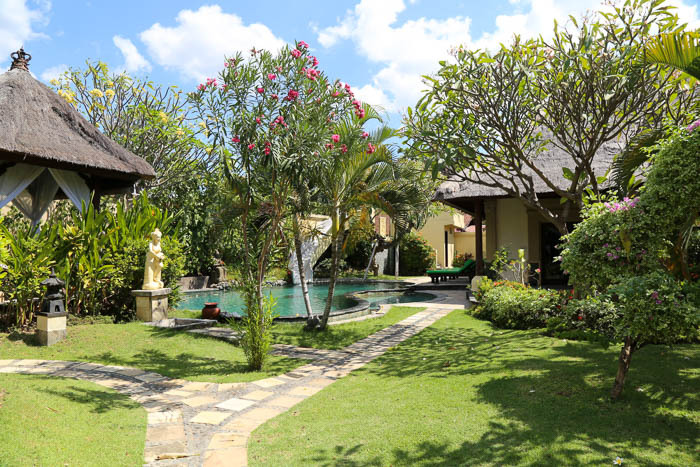 With stunning pools, beautiful spas, pure white beaches, amazing food and shopping right on your door step, the Ayodya Resort in Bali is ideal for families or couples wanting a relaxing holiday with a bit of culture thrown in. 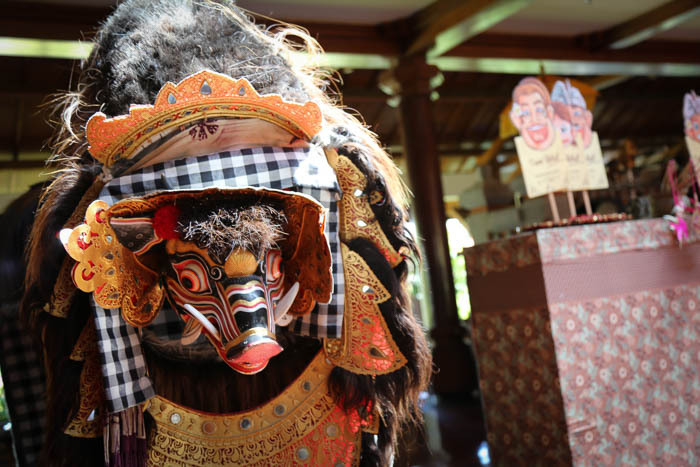 There’s plenty to do at the resort too with traditional craft making, morning yoga, Balinese dancing and more it’s an easy way to get a taste of the Balinese culture whilst also getting your beach or pool time in too. 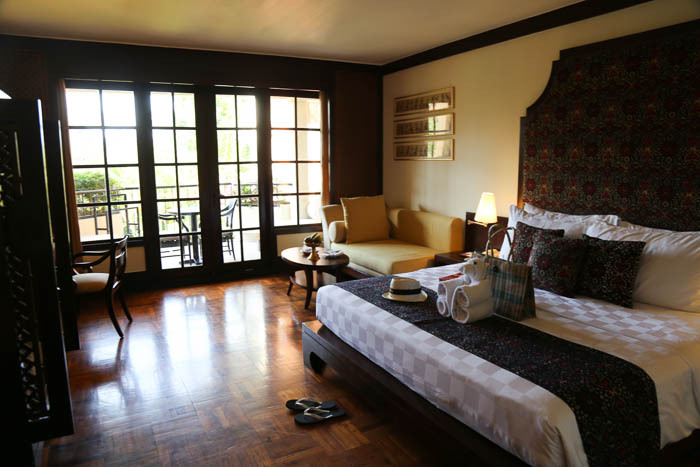 And for an extra special boost, book into the Palace section of the resort where you’ll have your own butler, private pool area, lounge and happy hour drinks to enjoy with other palace guests! 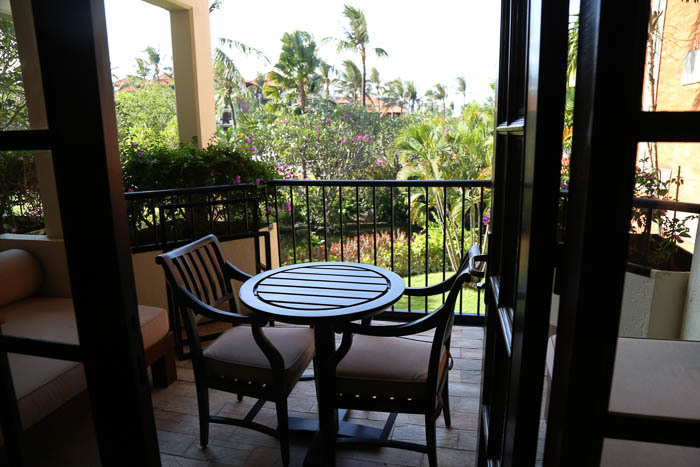 Oh, and breakfast on your balcony each morning that’s a must! 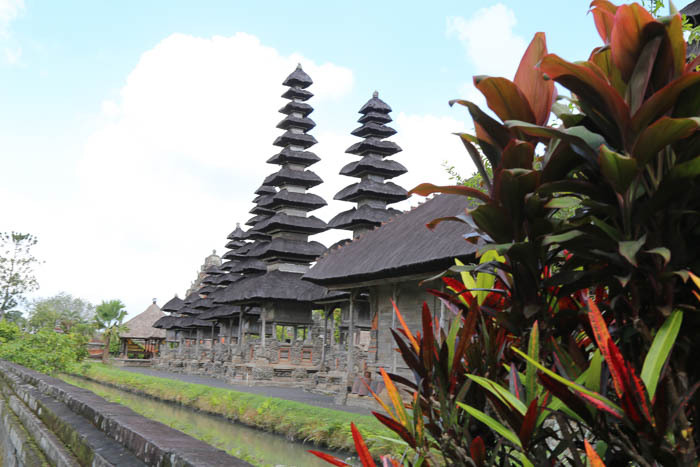 Bali is an incredible part of the world with something for everyone. 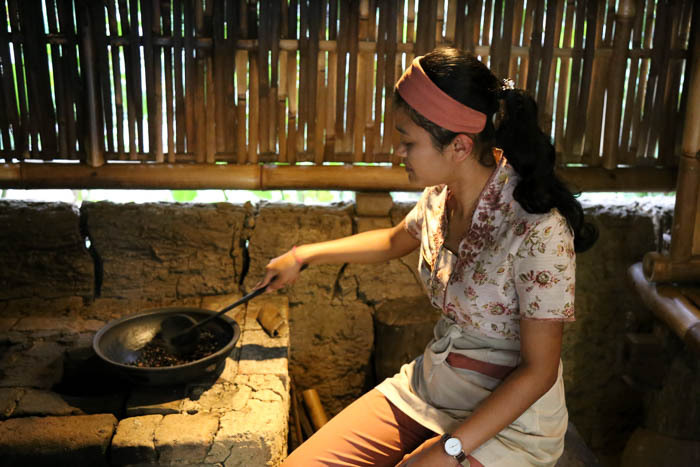 You can come over to relax and recharge whilst also immersing yourself in a new culture through their food and traditions – I love it. 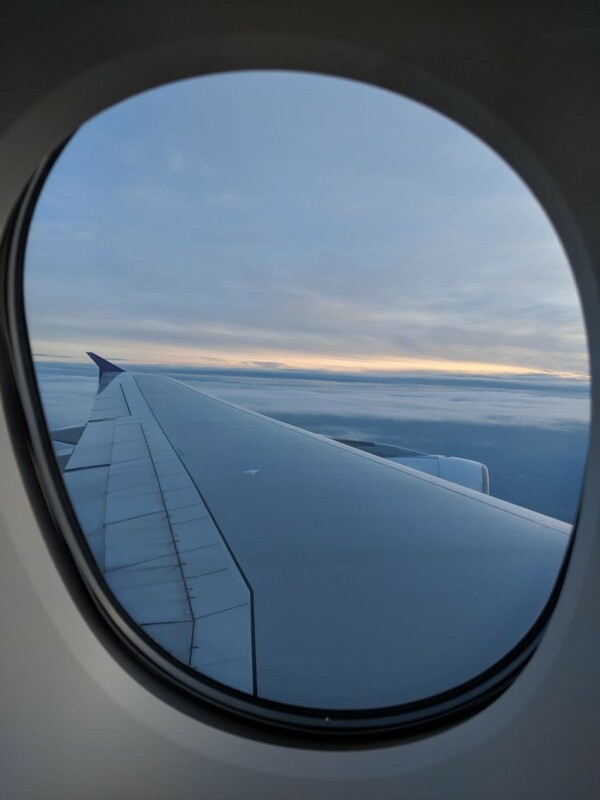 Thai Airways fly to Bali regularly from London Heathrow so take a look at their website for deals right now and start planning your dream trip! *Paid collaboration with Thai Airways. As always opinions and photos are all my own.